Kitchen cabinet sizes can vary depending on your requirement and whether you go for stock (factory-built) or customized ones. If your requirement is to fit-in some over-sized appliances, you may wish to go for custom-built cabinets. But otherwise stock kitchen cabinet sizes often come in standard sizes only. The kitchen cabinet sizes for base and wall cabinets can vary as per your space requirements but these are standard across and generally have increments in 3 inches. Kitchen base cabinets are usually 24 inches deep and 34 inches in height. Placing a countertop can raise it to 36 inches. 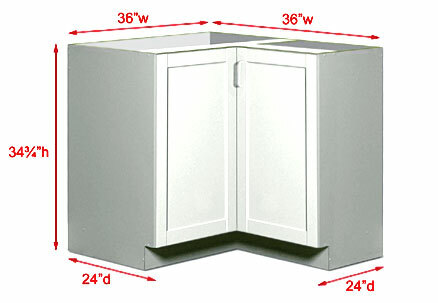 Widths of cabinets can measure anything between 9 to 48 inches and increase in multiples of 3 inches. It also depends on the kind of fixtures that you may want to add… like a basin or sink etc. For example a 30 inch is good for a single basin sink while a 33 or 36 inch is good for a double basin sink. Kitchen wall cabinets are usually 12 to 24 inches deep and can measure anywhere between 12 to 48 inches in height. Depth of wall cabinets should always match with the depth of base cabinets. Cabinets that may lie above refrigerator are generally 12 inches to 15 inches in height. However, their depth is standard just as your base cabinets. While kitchen cabinet dimensions can be chosen according to your requirements or constraints, you can either choose standard kitchen cabinet sizes or just go for your own dimensions to accommodate your kitchen appliances or have an island arrangement or other arrangements. These are easy to select as far as base and wall cabinets are concerned. However, when it comes to choosing corner kitchen cabinet sizes you have be careful about the measures. You need to know the corner angle, whether it is a diagonal wall and base angle or square corner wall and base angle or the blind corner base angle. They are far more difficult to adjust if you have your own customized settings and hence cabinets designed on standard kitchen cabinet dimensions may not fit. So, select your settings first. Another point is that if you have decided to go completely for standard kitchen cabinet size, then corner cabinets will be no exception and will be provided for by the makers. 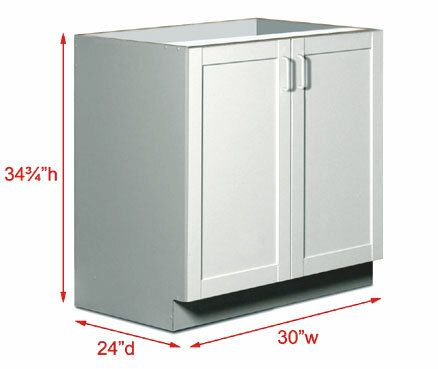 The corner kitchen cabinet sizes depend on where you are mounting them. If you have a diagonal or square corner wall cabinet, the standard sizes are 24 inch wide and 30 or 36 or 42 inch high. For a corner base, the width is 33 or 36 inch while height is 34.5 inch. While designing your kitchen cabinets, you will have to also consider the areas that you wish to include according to your requirements like the countertop, splashboard, sink or basin etc. Again there are standard kitchen cabinet dimensions for these areas. For base cabinets, standard countertop depth is 25 inch and splashboard height is 4 inches. The kickspace height is usually 4 inches and depth is 3 inches. If you plan to have drawers above cabinet doors then drawer depth is 4 inch. For wall cabinets, height above the countertop is 18 inch while height of cabinet above stovetop is 24 inch. Width, as stated earlier, should always match the base cabinet width. Extra storage is always an option for those who have an island in their kitchen. The added advantage is that you need not worry about matching their size or fitting with the other base cabinets. However, they do come in standard width sizes of 15, 18, 24, 27, 30, 33 and 36 inch. You just need to fix a countertop above your island cabinets and you have a great dining space in your kitchen. As an example 36 inch countertop is good enough for island cabinets that are 24 inch deep. Again the design and colors can be selectively chosen depending on whether you want to match them with the rest of the cabinets or just have some swanky new area in your kitchen. You may wish to keep the island height a little raised than the rest of base cabinet heights or just at the same level. In case of higher level ensure it is not awkwardly too high. In my observation, the reason why our kitchen cabinet sizes and dimensions should be in right measurement is so that we could move freely in our kitchen and not bump on the edges of the cabinet. It is much safer also for other members of the family. I am planning a new kitchen from scratch; any planning info would be helpful. My kitchen will be L-shaped and have two sinks, refrigerator, dishwasher, microwave (probably on counter,) gas range; I will have a 4′ x 6′ island.